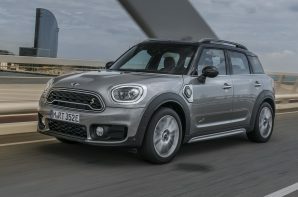 As sure as night follows day, each iteration of MINI is slightly less focussed, and more challenging on the eye than the last, and the latest Countryman is no exception. However in the shape of the plug-in hybrid variant there is much to admire as well as lament. Firstly the hybrid drivetrain is good. It combines a state of the art 1.5 litre 3 cylinder TwinPower Turbo petrol driving the front wheels through a six speed automatic ‘box, with electric drive provided by the rear axle. So in pure electric mode what we have here is a rear wheel drive Countryman which in our book is a good thing indeed. The system is capable of blending petrol and electric power to provide on demand all wheel drive or using either system independently depending on drive configuration and need. Left to its own devices (AUTO eDrive) the system prioritises electric running up to 50 mph when the petrol unit wakes up, selecting MAX eDrive extends electric top speed to 78 mph, whilst SAVE BATTERY keeps battery charge above 90% by running on petrol power alone. Whilst the Countryman was designed to accommodate a battery it is still a bit of a squeeze to fit the 7.6 kWh (gross) battery under the rear seats and the electric rear axle under the boot. The result is that the rear seat no longer slides and is slightly higher, the fuel tank is reduced from 51 litres to 36 litres and boot space is down from 450 litre to 405 litres. Of course as with all plug-in hybrids fuel and energy consumption is very dependent on usage and driving style. Officially it will cover 26 miles on a single charge before you start using your 36 litres of petrol. In the real world you can expect around 15 – 26 miles of EV running so both electric range and overall range are sensible. The net result of all of the changes is a small reduction in practicality for 15 – 26 miles of pure electric driving, which we think is a fair compromise. Factor in the sprightly performance, the MINI feel good factor, and a competitive price and you have an excellent addition to plug-in hybrid market.